Definition at line 167 of file llmultigesture.h. Definition at line 321 of file llmultigesture.cpp. Definition at line 328 of file llmultigesture.cpp. Definition at line 353 of file llmultigesture.cpp. References mFlags, mSoundAssetID, mSoundName, TRUE, LLDataPacker::unpackString(), LLDataPacker::unpackU32(), and LLDataPacker::unpackUUID(). Definition at line 369 of file llmultigesture.cpp. References llendl, llinfos, mFlags, mSoundAssetID, and mSoundName. Definition at line 362 of file llmultigesture.cpp. 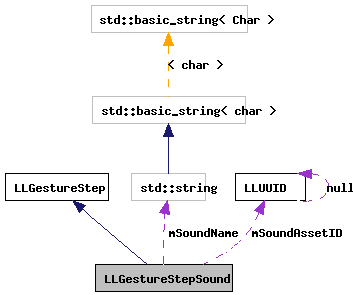 Definition at line 331 of file llmultigesture.cpp. Definition at line 173 of file llmultigesture.h. Definition at line 345 of file llmultigesture.cpp. References mFlags, mSoundAssetID, mSoundName, LLDataPacker::packString(), LLDataPacker::packU32(), LLDataPacker::packUUID(), and TRUE. Definition at line 186 of file llmultigesture.h. Referenced by deserialize(), dump(), and serialize(). Definition at line 185 of file llmultigesture.h. Referenced by deserialize(), dump(), LLPreviewGesture::handleDragAndDrop(), LLPreviewGesture::refresh(), LLGestureManager::runStep(), and serialize(). Definition at line 184 of file llmultigesture.h. Referenced by deserialize(), dump(), getLabel(), LLPreviewGesture::handleDragAndDrop(), and serialize().